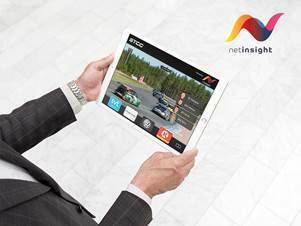 Stockholm, Sweden - Net Insight, the leading provider in media transport and resource scheduling, today announces that the STCC Live app is now available for download and will be used in conjunction with the Swedish Touring Car Championship, STCC race in Sweden on June 17, offering visitors an experience of the future of TV. The app is based on Net Insight's live OTT solution Sye that enables synchronized TV distribution without time delays, to all screens, such as mobile, computer, TV and tablet. Synchronization and the ultra-low delay between live to stream device is unique in the market. During the event, visitors will be able to try the solution for the first time by following the STCC race via the app and getting exclusive extras to complement the race. This is a first glimpse of television in the future and this type of expanded functionality will be of great importance for how next-generation live events will be consumed. Providing a synchronized stream to all screens creates new interactivity for viewers and new opportunities to gain additional revenue for businesses.